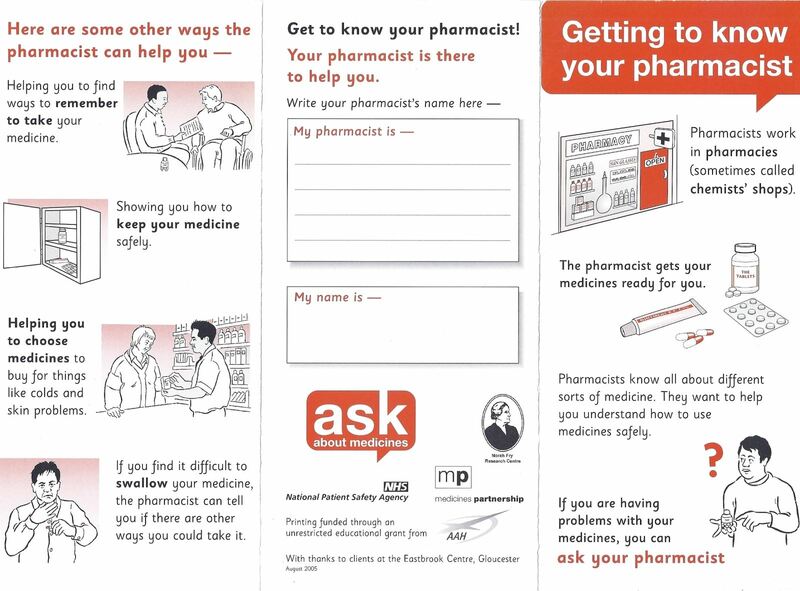 Ask your pharmacist [part 1] [part 2] - a leaflet aimed at helping people with a learning disability to know how to ask their pharmacists for help and support, and how they can help. Advice for patients, families and carers - an easy-read NHS England leaflet for patients and carers to better understand antipsychotic medicines, along with other sources of information. Communication jargon buster - a General Medical Council leaflet on avoiding jargon in communication with people with a learning disability. Going to the chemist - an easy-read leaflet from the Down's Syndrome Association to support those with a learning disability in going to the pharmacy. 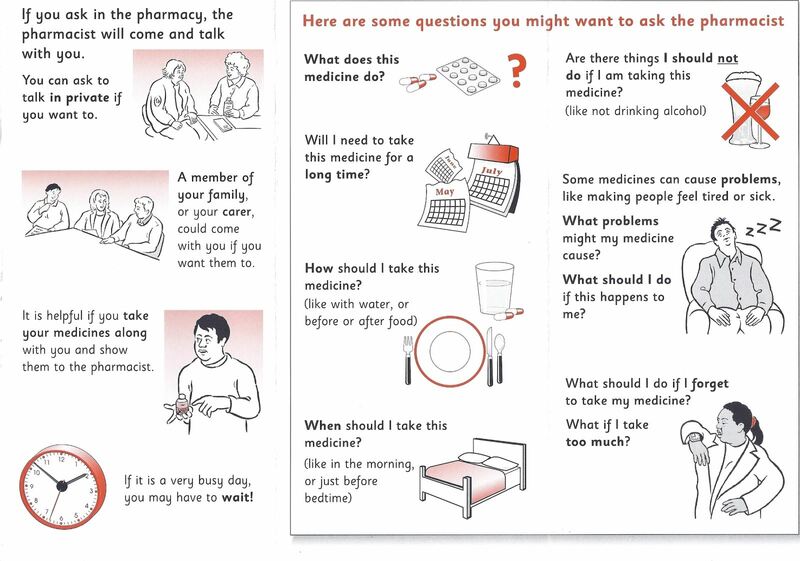 Medicines information leaflet - for patients with a learning disability and their carers. So your next patient has a learning disability? - a poster with advice on adjustments you can make for people with a learning disability. Supporting people with learning disabilities - a Giving Voice and RCSLT leaflet on how to support people with a learning disability, with references and resources at the back. STOMP it out! - a leaflet by NHS England introducing the STOMP (stopping over-medication of people with a learning disability, autism, or both) health campaign, including information about psychotropic medicines. Stopping over-medication of people with a learning disability, austism or both (STOMP) - a leaflet by NHS England focusing on the prescription of inappropriate psychotropic medicines. British Institute of Learning Disabilities (BILD) - easy-read information about health. Disability Matters - educational, inspiring, informative and inclusive e-learning resource for the UK workforce to challenge and positively change our own and others' fears, ideas and attitudes towards disability and disabled children and young people. Easy Health - a good place for nutrition and health advice for people with a learning disability. General Medical Council - learning disabilities page, including interactive videos. Learning Dis Elf - Twitter account to follow to keep up to date with learning disabilities evidence from websites, journals, networks, guidance and reports. Makaton - find out about Makaton training, in order to help with communication techniques. Mencap - resources include an information sheet linking to an easy-ready advice leaflet for people with disabilities, a checklist for pharmacies to ensure they meet the requirements of the Accessible Information Standard, and other handy hints. MindEd - an educational resource about children and young people's mental health for all adults. NICE - NICE pathway on Challenging behaviour and learning disabilities. RCGP - the Royal College of General Practitioners page on learning disabilities is useful to see what is covered in care planning and the health check for different types of learning disability. Royal College of Psychiatrists - page on learning disabilities; readable and well-researched information for the public. Royal College of Psychiatrists' Partner in Care campaign - page on learning disability and mental health; abundance of information for carers, healthcare professionals and support workers. Talking Mats - a website to help improve the lives of people with communication difficulties, and those close to them, by increasing their capacity to communicate effectively about things that matter to them. University of Birmingham - learning disabilities medication guideline. Yammer - MOOC training via Canvas for learning disability, accessed through Yammer, which helps with collaborative working with the multidisciplinary team. A bit like Facebook for learning disability, with a useful board to share best practice.